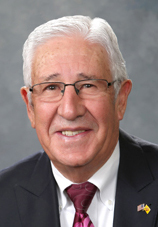 Larry Larrañaga, 80, who represented New Mexico’s 27th District in the New Mexico House of Representatives since 1995, died Oct. 10 from a brief illness. ﻿He resigned from the Legislature last week after he had earlier announced that he wouldn’t seek re-election this year. He earned both a bachelor’s and master’s degree from the Department of Civil, Construction and Environmental Engineering in 1970 and 1979, respectively. Christos Christodoulou, Jim and Ellen King Dean of Engineering and Computing, said UNM and the School of Engineering are extremely grateful for Larrañaga’s support through the years. In addition, in 2016, he sponsored legislation that made matching funds possible to endow the School of Engineering deanship as the Jim and Ellen King Dean of Engineering and Computing. The endowed deanship generates extra funds yearly for the School of Engineering dean, which can be used for research or other programs to benefit students or the school. It is the first endowed deanship at UNM. Christodoulou said the School will honor Larrañaga with a moment of silence at the School of Engineering Distinguished Alumni Awards event at Embassy Suites on Oct. 25. Last year, Larrañaga was the featured speaker at the event. Larrañaga was born in Encino, N.M., and. He has owned his own ranching company since 1978 and was an owner/partner at Bohannan Huston Inc. from 1989-2005. He served on the advisory board for the Department of Civil, Construction and Environmental Engineering. Larrañaga was deputy chief administrative officer and public works director for the City of Albuquerque, secretary of highways for the State of New Mexico, and a district engineer for the highway department for the State of New Mexico. He is a veteran of the U.S. Army. He was a member of the House Appropriations and Finance Committee, the House Agriculture and Water Resources Committee, and the House Rules and Order of Business Committee. He is married to Charletta, and they have two children, Alan and Pam. The family has requested that donations be made in Larrañaga's honor to the School of Engineering Fund for Academic Excellence.